Last night there was a great event – Ignite Ann Arbor 11 – at the downtown branch of the Ann Arbor District Library. My speech didn’t go as planned but I am grateful. I am grateful that my brother drove all the way from Grand Rapids and that a great childhood friend came from Chelsea. I am grateful that six friends from Westminster Presbyterian Church surprised me by attending. I am grateful to my wife who came straight from work and therefore didn’t really get dinner last night. I am grateful to my stepdaughter Aimee and son-in-law Sean and, finally, to grandchildren Peter and Anna who sat through talks that held absolutely no interest for them just so they could hear Boppa’s talk. Here is the text of the speech I wanted to give. risk-taking and growth. Time and time again she flourished by breaking out of her comfort zone and accepting the risk of whatever might be around the next corner. By way of example, After my father died money was tight so she decided to turn her home on Lake Michigan into a bed and breakfast. I thought the B & B was a terrible idea but she didn’t listen to me. She made money, new friends and was able to keep her house. A decade or so later she married her high school sweetheart and moved to the Pacific NW, leaving her comfort zone 2500 miles behind. My brother Tom and I are nearing the end of a quest to paddle the length of the Grand River. The Grand is Michigan’s longest river. It starts south of Jackson and runs through Lansing and Grand Rapids before emptying into Lake Michigan at Grand Haven 262 miles later. I’m no outdoorsman and this trip has taken me out of my comfort zone . Before we started I had never spent more than 20 minutes in a canoe in my life, and that was 50 years ago at summer camp. The idea for this trip had been rambling around in my head for a long time but I finally pulled the trigger when I overheard my wife making plans for a trip to Italy with her daughters. My nose was out of joint because I wasn’t included but when I said as much my wife reminded me that I had been sober for 4 years and this trip was going to involve time spent in vineyards, as a trip to Italy should for anyone without a drinking problem. In some sort of effort to save face I announced, “Fine, but I’m going to canoe the length of the Grand River!” She thought that was a fair trade and here we are. Now . . . I spent every summer of my youth at our family home on Lake Michigan in Grand Haven, just a mile north of where the Grand empties into the Big Lake. The river called to me every day and it would have been a rare day that I didn’t walk down the beach to the pier to marvel at the giant lake freighters steaming into the river, or to see how the perch were biting. Other memories of the Grand haunt me pleasantly as well. Memories of hiking through the dunes to a rope swing that dropped us into a deep spot in the river, memories of showing off for local girls on the banks of the river while the waters of the Grand Haven Musical Fountain swayed and shimmered in the background. So I knew the Grand but only its last mile or two and I held onto my dream of exploring its entire length. Even then, it almost didn’t happen. Life gets in the way. As Harry Chapin explained, there are always bills to pay and planes to catch. The decision made, however, there was never any question that my brother would join me. He alone understood that this quest was our equivalent of Huck and Jim’s journey down the Mississippi, of Mr. Stanley tracking down Dr. Livingstone. This was planting our flag at the North Pole. So . . . we bought a used canoe and named her the Billie V in honor of our grandmother. We started our quest at the river’s source and in 3 paddling seasons have made it to Ada, just shy of Grand Rapids. We would have finished this year were it not for high water in the early Spring and our mother’s death but, God willing, we’ll reach the Big Lake early next summer. So how is my life better as a result of breaking out of my comfort zone and exploring the Grand? To start, my brother and I haven’t always liked each other as much as we do now. The river has been a place to heal, to let bygones be bygones. We have grieved our mother’s drawn out and painful death and shared our thoughts on subjects that would likely never have been broached without this time together. We’ve created an outlet for our writing and creativity at lengthofthegrand.com. I’m always happy on the river, and discovering a new source of happiness is a wonderful gift at any age. We’ve re-discovered the gift of solitude. Paddle 10 minutes downstream from Lansing’s bustling Old Town and you’ll find yourself all alone and surrounded by green. The Great Blue Heron has become our spirit guide and we’ve seen stretches of the river where Bald eagles are more plentiful than blue jays. In this time of dismal political debate we elevate our spirits by reciting poetry and singing aloud the great songs of our youth. I still can’t convince Tom that McArthur Park is a great song – with its sweet green icing flowing down – but I’ll never stop trying. So now I’ll ask you: what is your Grand River? What real or metaphorical mountain have you dreamed of climbing, what sea sail across? More importantly: What’s stopping you? Wait: I think I hear my mother calling!! She says that you – all of you – need to get out of your comfort zone and start paddling. You never know what might be around the next bend. Thank you for visiting our blog; if you like it, please share it with a friend. You can contact us by leaving a comment here or by email: Joe@lengthofthegrand.com (Joe Neely) or Tom@lengthofthegrand.com (Tom Neely). You will also find us on Facebook. I always take the river’s side . . . Industry and Big Agriculture have friends in high places already. 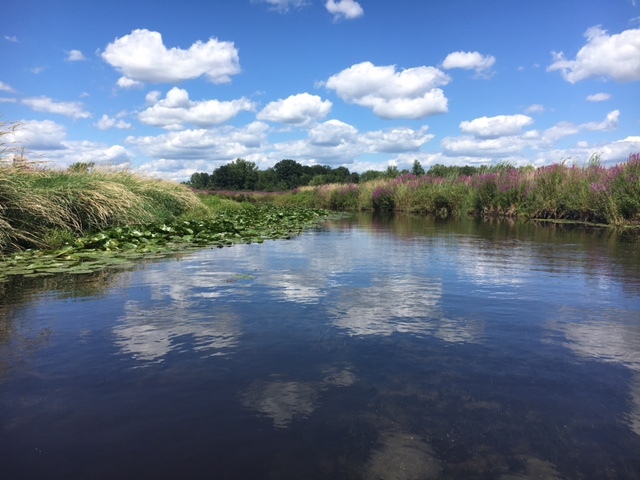 This entry was posted in Environment, Great Lakes, Michigan, rivers, Uncategorized and tagged brothers, canoeing, eagles, Grand Haven MI, Grand Ledge MI, Grand Rapids MI, Grand River, Jackson MI, Lake Michigan, Lansing MI, Michigan. Bookmark the permalink. This one made me cry! Darn you guys! How wonderful that you are out of your comfort zone. I am as I write this as I am in a public library. THANKS! 🙂 I am out my comfort zone next week as I attend the ACA Leadership Conference in Charleston SC. I signed up for some classes that have me needing another CT head scan! The hubby is not with me on this one and this retired Tough Army Chick is going to be fine but really has me… well nervous.